How much money do you want to put on this gift card? How many of these cards would you like? A great gift for any beer lover. This product ships free within the US at any dollar amount via USPS first class service. If you need an instant gift certificate check out our Instant email option. Since this product ships First Class Mail, shipping will take 5-7 days, and tracking is not available. Gift Cards never expire and are redeemable online, over the phone, or at any of our retail stores. Recipient request for birthday gift. Gift for my son. He enjoys brewing beer and uses More Beer for his brewing needs. Something for all the brewers in your life! Son shops your site often! Perfect gift for the home brewer! It was recommended for my son, by his wife. My Brother uses your site. It was requested by my son who makes beer. Great gift for my son. Have a brewing brother-in law! Dad just got into Brewing! This is where my son-in-law shops for his beer-making equipment, so a More Beer gift card is the perfect gift! Easy way to give another beer lover a gift. son has birthday and is saving for some equipment. this is what he requested. My son inlaw enjoys your products. My Son in law buys from you and it's his birthday present. Birthday Gift for my son-in-law who loves making beer and purchases his supplies here. I picked the gift card for my son's birthday. This is what my husband asked for. A gift card will allow my husband to select exactly what he wants. Was requested for a gift. My son brews a lot of beer and gets stuff from you. The recipient can get what ge wants. Merry Chridtmas. 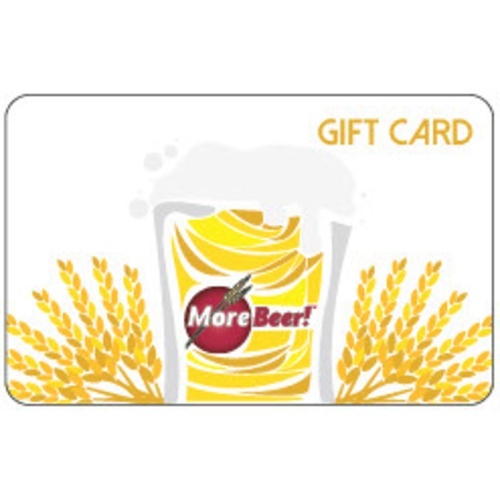 Hello, can a MoreBeer gift card be used for MoreCoffee items? BEST ANSWER: Yes! Not a problem. How do you check a balance on a gift card? BEST ANSWER: Please call 1 (800) 600-0033 and we will be happy to give you the remaining balance on the card. Thank you for your interest. Please give us a call at 1-800-600-0033 or email us at info@moreflavor.com so that we can assist you. We are here to help. Cheers! I ordered a gift card online as a present for Christmas and it was in my mailbox in two days. So easy! The ability to purchase a gift card in any amount online was extremely simple, fast and convenient. The actual physical card arrived two days later and the recipient loved it. cheers! The card was easy to order, it arrived quickly, and the recipient was very happy to get it. I know it was Christmas time however had to call because it didn't show up. It then showed up in 2 days. Still like the beer. Fast & Easy to shop on line. Mailed the gift card to a very old address we had on file even though when I filled out the information I put in all of our current info it was like the system overrode what I put in. Pretty annoying and looked bad since it was a gift. I just ordered a gift card. But it is for the man of my life who is the best Dad in the world to our four kids. His only hobby is brewing beer, but it is also his passion. He makes the best beer and cider you can imagine. That is why I always go with more beer. com. They have the freshest products you can find. Thank you for helping the most deserving man in the world with his hobby. Thank you Joan!! Glad we can help you and your husband. The web site provided a very easy order experience and the gift card arrived sooner than expected. Thank you. Great gift for my son, the “brew master”. Ordered a gift card for my brother and it arrived quickly. Very easy to order and quick delivery. Easy to order & fast delivery !! I was disappointed that you could no longer print them out. This was a gift to my husband and he is retired so guess who gets the mail. So no longer can I surprise him because no longer are you able to just print the gift certificate. I wish you had the option to do both. Where did the emailable Gift Certificates go? When some one ask want you want as a present, just ask for a gift card!